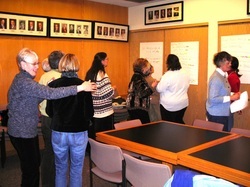 Each year the League of Women Voters Duluth holds a planning meeting to propose program changes which are voted on at the Annual Meeting by the membership. Preserve the character of the community and promote community identity at neighborhood and city wide levels. Ensure that areas of new growth are coordinated with existing and proposed development. Prevent urban sprawl. Put structures in place to consistently implement and update the plan, including a schedule for ealuation and review.